We are in love with seashell mermaid crowns! 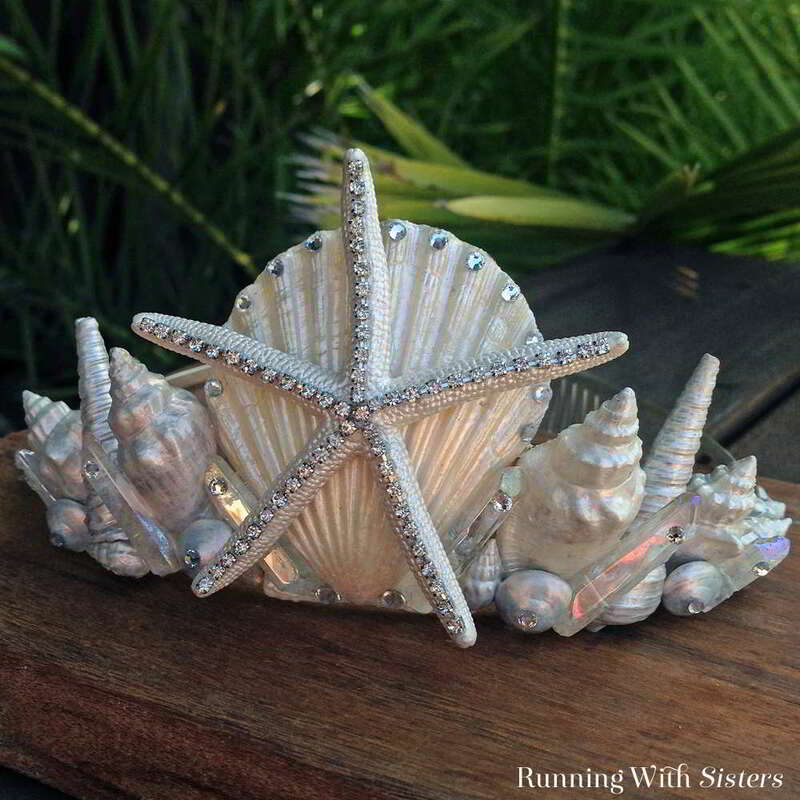 We’ve seen all kinds of shimmery seashell tiaras this summer so we had to make our very own Seashell Mermaid Crown. 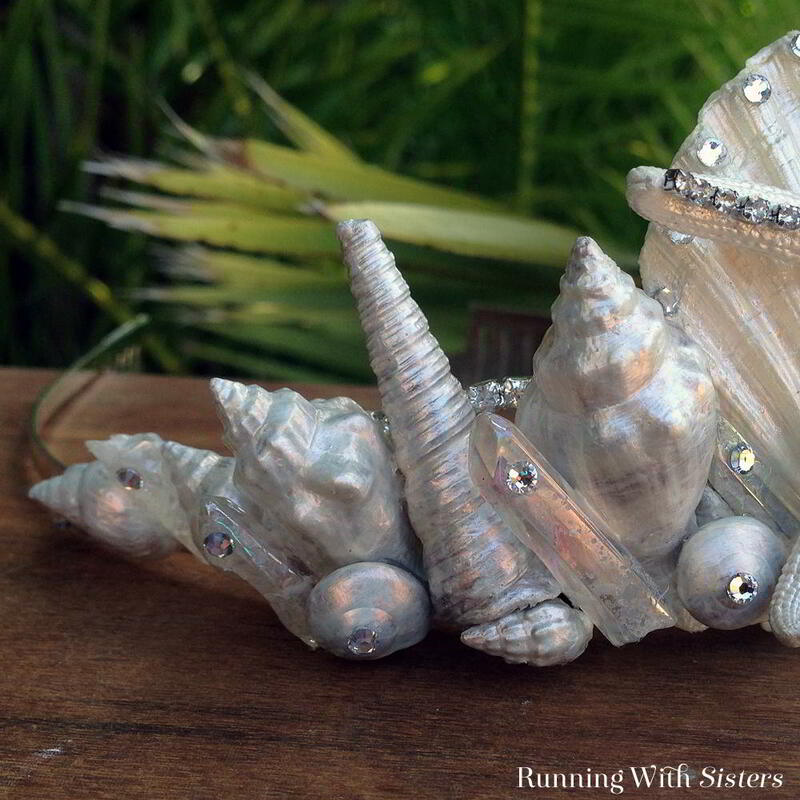 We started with an inexpensive rhinestone tiara and used it as a canvas to arrange our shells on. 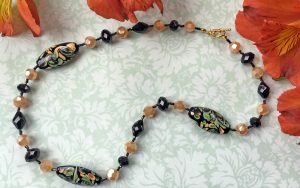 Then finished the shell headband with tiny gems. So glam! 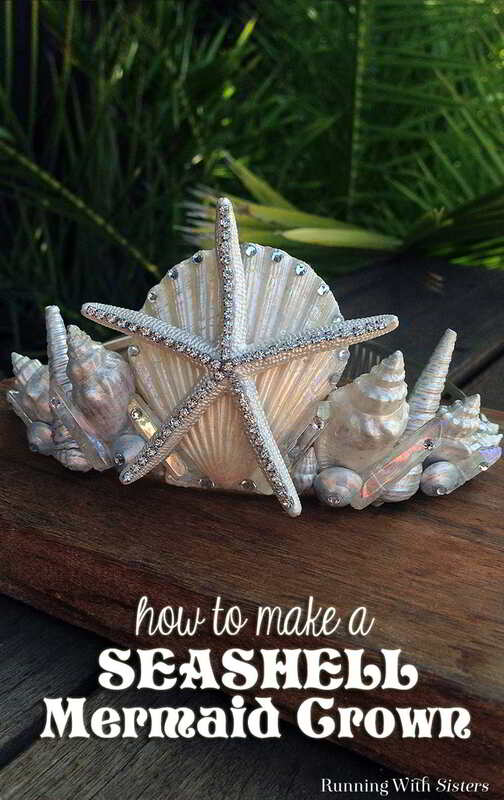 Now you can make your own Seashell Mermaid Crown! What would you do with a Seashell Mermaid Crown when you’re not wearing it? We think it will look great on a bookcase with some of our best shells around it. What do you think? Let us know in the comments! 1. 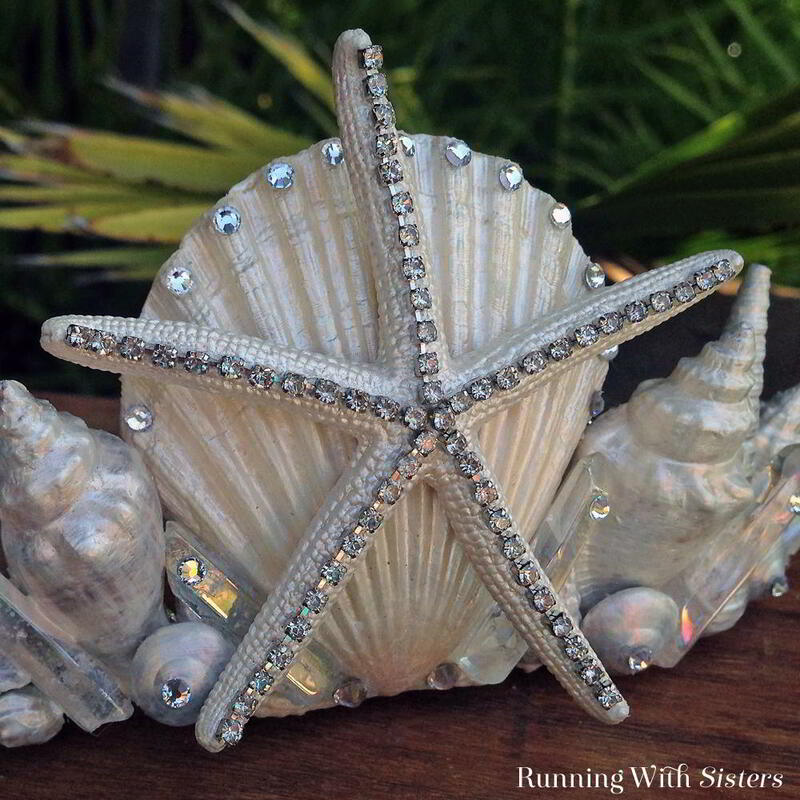 Paint the shells and starfish Mother of Pearl and let dry. 2. 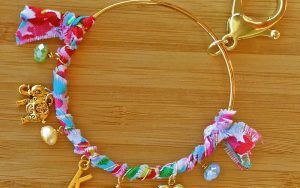 Embellish the starfish with rhinestone cup chain. To do this, snip the cup chain into strips to fit. Apply the E6000 directly to the arms of the starfish with a toothpick and place the strips of cup chain on top. 3. Glue the scallop shell to the front center of the tiara using the E6000. Hold the shell in place for a minute or two while the glue sets up. Glue the starfish on top of the scallop so one of the arms points straight up. 4. Sort the horse conch shells from largest to smallest. Glue the two largest conchs on either side of the scallop shell so they are standing almost upright. Glue the two turrets on either side of the conchs followed by the next two largest conchs. Glue the next two conchs at a slight angle, then glue the last two conchs on either side so they rest horizontally along the tiara band. 5. Sort the quartz points from largest to smallest. Tuck and glue the four largest quartz points so they are standing up in the gaps between the scallop shell, the largest conchs, and the turrets. Glue the rest in between the rest of the shells along the tiara band. 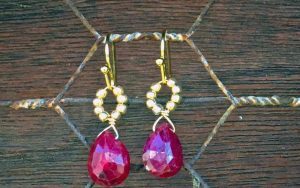 Here’s a video showing how we handle and glue tiny rhinestone gems. 6. Tuck and glue the rest of the tiny shells in any gaps along the tiara band. Glue 3mm rhinestones around the outside edge of the scallop shell, using the toothpick to apply the glue. Glue two 4mm rhinestones to the bottom of the scallop shells and two on the outside edge of the tiara band. 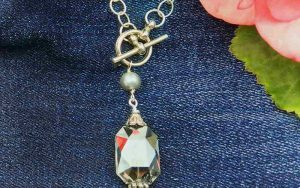 Finish by gluing a 3mm rhinestone to each quartz point, and round cat’s eye shell. We love getting pinned! Thanks for sharing! would probably display it on the bookshelf in my living room for sure! It is so glam! We have it displayed on a shelf in the guest bathroom with lots of other shell and beachy things. So pretty! You should make one! Where did u find the materials for this project? I can’t find anything other than small random seashells! beautiful! 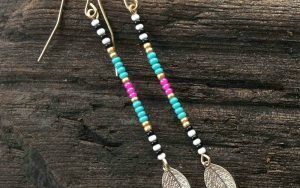 been seeing these tiaras all over the place, can’t wait to make one! Thanks Kami! Aren’t they so fun?! It sits up on top of the head, not down around the ears like a headband. It has combs to secure it and you can add bobby pins too. But frankly, we just have it set out as a cute decoration and haven’t worn it around for any length of time.